Bart's construction site three weeks ago. Plans to build a new state-of-the-art Gozo General Hospital have been put on hold despite contractual obligations it had to be up and running by last May, the Times of Malta is informed. According to a €2 billion deal signed by the government in 2015, the private concessionaire taking over the management of three public hospitals had to provide a new general hospital in Gozo by May 2018. The concessionaire, Steward Health Care, which is already receiving tens of millions of euros from the government, was also bound to remodel and refurbish the current Gozo hospital by last September. A draft development master plan, submitted to the Planning Authority in 2016, was frozen with no progress on the application dossier having been registered since January last year, healthcare industry sources said. The master plan had been submitted by Vitals Global Healthcare, which faced serious financial problems last year and sold its 30-year government concession to Steward Health Care for a still undisclosed sum. The sources said Steward Health Care had not registered any progress with the planning watchdog and the Gozo master plan application still bore the details of VGH. Neither the Health Ministry nor Steward Health Care replied when asked for an update on the projects. Health Minister Chris Fearne had said this was “the real deal” when Steward Health Care took over from VGH. Gozo Hospital staff members were not being updated on what was going on, the sources said. “The only construction taking place, although at a slow pace, is on the Barts campus facilities. On the hospital’s side, not even one stone was moved or changed by Steward,” the sources added. According to the concession agreement, students were expected to start frequenting the campus last year. However, the building is far from completed and lectures are being given in a temporary campus situated in part of the Sixth Form, in Victoria. So far, none of the “concession milestones” in the contract signed by the government have been met, the sources pointed out. These “milestones” were redacted when the government published the contract after pressure by the Opposition during the last legislature. Prime Minister Joseph Muscat had said the private concessionaires had to invest about €300 million in the first four years of the agreement and build new facilities at the three hospitals: St Luke’s and Karen Grech in Malta and the new one in Gozo. The National Audit Office is reviewing the deal. Construct and outfit a medical school to be operated by Barts of London and the London School of Medicine and Dentistry for 300 students. Construct new state-of-the-art hospital equipped with 200 to 250 acute care beds connected to the current Gozo General Hospital. Redesign and remodel existing building at Gozo General Hospital to host a combination of long-term geriatric care facility and rehabilitation care facility equipped with at least 150 and 50 beds respectively. 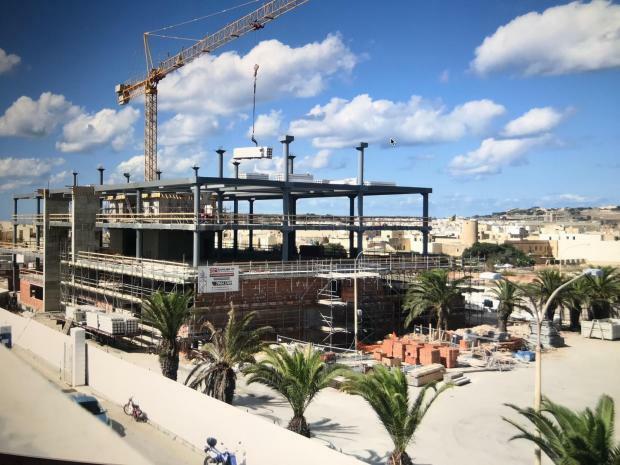 Steward, which failed to reply to Times of Malta when asked for an update on the project, said in a statement on Friday it has begun works on the master plan for the new hospital in Gozo and the re-development at Karin Grech and St Luke’s Hospital. “Like all projects of this magnitude, the planning phase is arguably the most critical, which is why Steward and the government have agreed to re-set the timelines in a way which allowed for the proper development of the plans. “Steward Malta is committed to deliver on all obligations as set out in the concession agreement and will make the appropriate announcements in due course,” it said. It said it took over the concession in Malta in March, with a clear requirement to prioritise the construction of the Barts Medical School. In seven months, it delivered on the design and build of a state-of-the-art anatomy centre, which had now been passed over to Barts for their use, and structurally completed the Barts Medical School, with works on the interiors progressing at a steady pace. It said that its aim was to build facilities which not only met the needs of the current population but would also serve as state-of-the-art hospitals for years to come.